We have a local bakery/restaurant that makes some pretty good cinnamon rolls, but they're just "off". They use way too much butter and not enough cinnamon, no raisins (shame), and cream cheese frosting. Good for a bite or two, then it's just too much. So, after the disappointment, I had to make my own cinnamon rolls! I use the bread machine version, and usually use some ready-made vanilla frosting that I let melt on top while the rolls are still hot, although the honey butter icing would probably be quite good. 1. In large bowl, combine 3/4 cup flour, oats, granulated sugar, undissolved yeast and salt. Heat 1/4 cup butter, milk, and water until very warm (120º to 130ºF). Gradually add to dry ingredients; beat 2 minutes at medium speed of electric mixer, scraping bowl occasionally. Add egg and 1/2 cup flour; beat 2 minutes at high speed. With spoon, stir in enough remaining flour to make soft dough. 3. On lightly floured surface, roll dough to 18 × 8 inches; brush with melted butter. Sprinkle with brown sugar, cinnamon and raisins, if desired, to within 1/2 inch of edges. Roll up tightly from long side, pinching seam to seal; cut into 9 equal pieces. Place, cut sides up, in greased 8 × 8-inch pan. Cover; let rise in warm place 45 to 60 minutes or until doubled. 4. Bake at 350ºF for 25 to 30 minutes or until done. Remove from pan; cool on wire rack. 5. In small bowl, mix powdered sugar and softened butter with fork until blended; stir in honey until smooth. Drizzle or spread on rolls. Notes: Bread Machine Variation (all-size machines): Measure dough ingredients into bread machine pan as suggested by manufacturer; use 2 1/3 cups all-purpose flour and 1 1/2 teaspoons Fleischmann's® Bread Machine Yeast. Process on dough/manual cycle. When complete, remove dough to floured surface; knead in additional flour to make dough easy to handle, if necessary. Roll out dough and proceed as directed. OMG, PianoLady--- could I drop by for one of those? OO those look really delicious. Cinnamon rolls have always been a favourite of mine with a hot cup of milky coffee. Thanks for posting the recipe Pianolady!! I've taken a copy of it and will be trying those for myself. 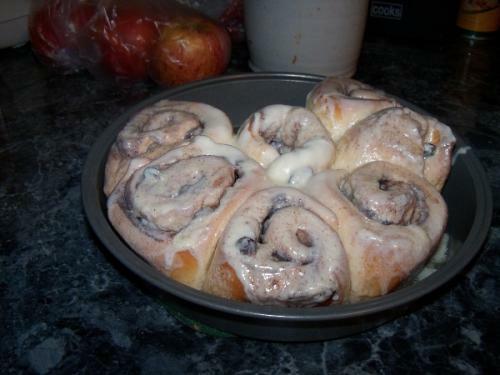 I can hardly wait to have home-made cinnamon rolls whenever I want them. Mmmm! I can almost taste those as I sit here with my morning coffee! And thanks for the recipe - I'll let you know what the family think of them! I love it that you included the the bread machine version, my wrist on my right hand is bad and the thumb on the left is weak too. Gonna give these a try this weekend.